Spending time in the US has honed my trashy food palate, and made me crave things I never ever craved before being exposed to game day menus and Thanksgiving spreads. I've always been a bandit for salty snacks, and dipping is such a thing stateside, that when I met a dip that also had two of my other favourite elements - artichokes and creaminess, I knew we couldn't be separated. Interestingly, I had never veganized this until I recently tried to make some tortillas. When my dear friend David died recently, I was given his tortilla press. Keen to get squishing balls of dough in his memory, and make some delicious tacos, I found a recipe on the interwebs called 'Best flour tortilla recipe ever'. Now who doesn't love an epic headline like that. I believed. Then I made them, and instead of being light and fluffy and pliable, they were thick and intractable. No good for tacos, and as it was Friday night and the hunger hour was at hand, I had to get dinner sorted. What to do? 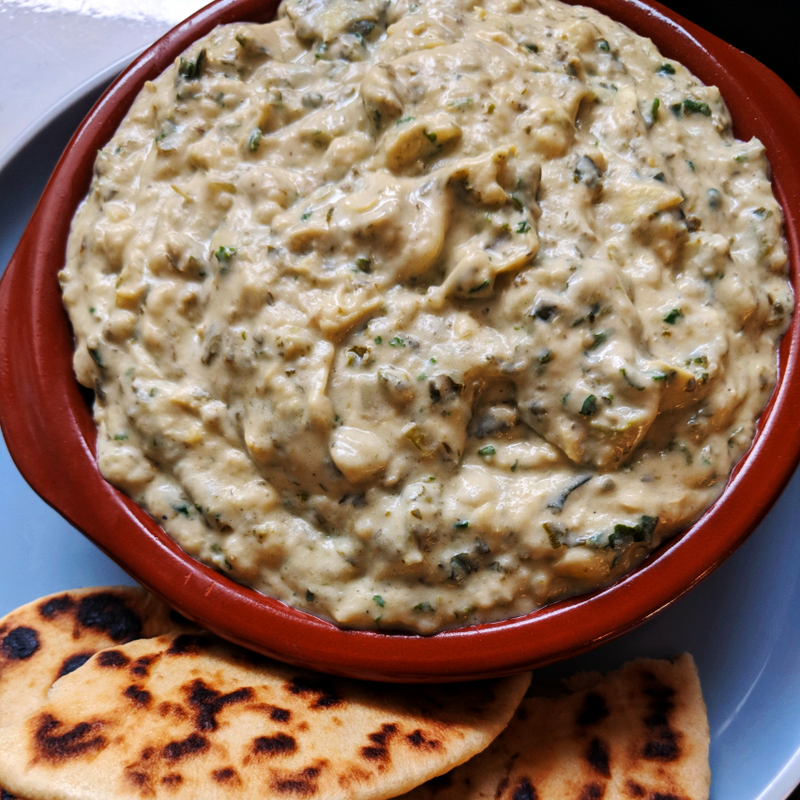 When faced with delcious thick flat tortillas, the only answer was make a dip, and the miracle of pantry and fridge was I had all of the ingredients for the veganized spinach and artichoke dip to appear. I'm not going to give you a tortilla recipe, as the one I have is definitely not the best ever. Heat olive oil in a pan over medium heat. Add garlic and saute for 1 minute, stirring frequently. Add artichoke hearts and spinach and saute until spinach is wilted. (If you are using a thermomix or other heating blender, do it all in the one appliance). Transfer to a blender, add cream cheese, mayo, garlic powder, parmesan, jalapeno or hot sauce if using, salt and pepper to the roughly blend so there is still some texture. Spoon into a serving bowl and serve. Use corn chips, or rice crackers, or flour tortillas, or your finger, I don't care, just rip into this any way you can!